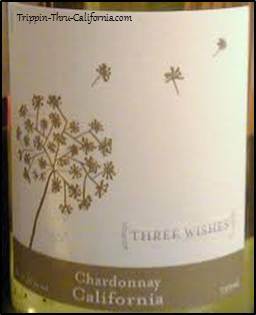 How does Three Wishes Wine compare to Two Buck Chuck or Oak Leaf? 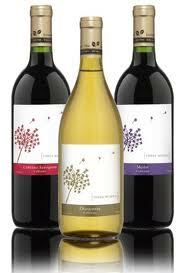 Three Wishes Wine is sold at Whole Foods Market for only $1.99 a bottle! in California, ($2.99 a bottle everywhere else). At that price, it’s like one of your wishes already came true. But….is it any good? It comes in three varietals: Chardonnay, Merlot and Cabernet Sauvignon made from California grapes in environmentally friendly lighter weight glass bottles. While no one expects to be blown away by wine that costs less than a gallon of milk, they also don’t want to get home and open up a bottle of disappointment. So are these Wines any good? After tasting all three varietals, here’s what I’ve come up with. Chardonnay - I tasted mostly pineapple, apple and pear with floral aromas, sort of juicy like Welches but not as sweet. There wasn't any signs of oak here which probably pleases the masses. Very easy drinking. Merlot - This one has bright red berry and cherry characteristics with a touch of currants. It also has gentle toasty vanilla flavors and a touch of oak on the finish. It's very easy drinking as well with soft tannins. Cabernet Sauvignon - Even though I'm a Chardonnay kind of girl, this one was my favorite of the Three. It's the most complex but certainly not as complex as most California Cabs. It has hints of dark fruits like blackberries, black cherries and plums with a sort of tobacco / cigar box type nose. Interesting. Two Buck Chuck Charles Shaw Wine at Trader Joe’s $1.99 a bottle. Oak Leaf Wine at Wal Mart $1.97 a bottle.